Within hours of last November's Paris attacks, the social media world joined together under the hashtag #PrayForParis, offering a glimpse of global solidarity for those killed, injured, or otherwise affected by the senseless deaths of 130 people. Although it was no doubt comforting to the victims' loved ones, many people pointed out that there is often no such social media support for non-Western countries, showing a blind spot in many people's empathy. But after a suicide bomb exploded in Istanbul, killing five on Saturday, #PrayForTurkey started trending on Twitter, which is a hopeful sign that the world still cares when acts of terrorism occur in Muslim countries. 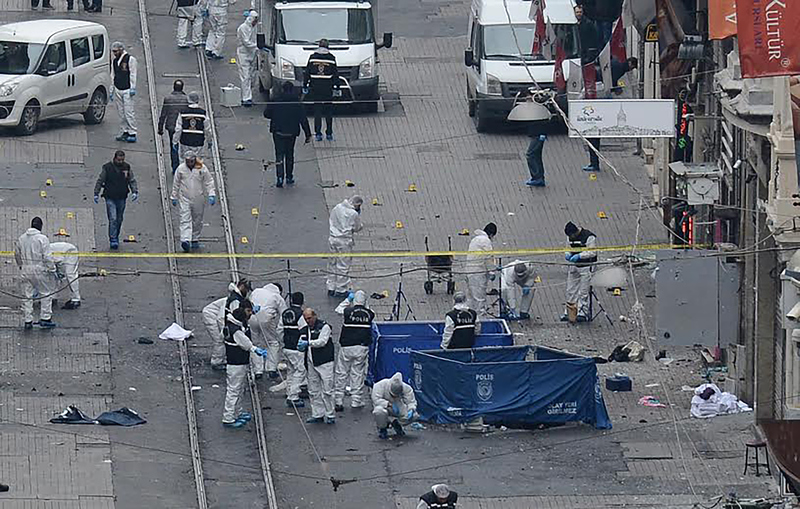 Five people, including the attacker, were killed when a suicide bombing occurred in the shopping district of Istanbul. At least 36 others were wounded in the attack. According to Reuters, Germany shut down diplomatic missions and its schools in the country on Thursday due to a specific threat, and the U.S. and some European embassies warned their citizens to be careful heading into the weekend's Newroz celebrations, a Kurdish spring festival that has turned violent in the past. So far, no group has claimed responsibility for the attack. This is the fourth attack to hit Turkey in 2016, including two separate bombings in the capital of Ankara over the past month, which killed a total of 66 people. So it's no surprise that many people are fed up by the perceived lack of coverage and global empathy toward the country. Many people on the #PrayForTurkey hashtag mixed their sorrow with frustration. Some users took the opportunity to remind people to that terrorism has no religion. Although there has been no claim for the attack, two senior officials told Reuters that the attack could have been carried out by the Islamic State — which was blamed for a suicide bombing in January that killed 12 German tourists — or the Kurdistan Workers Party (PKK) that claimed responsibility for the two attacks in Ankara. Although the PKK isn't directly affiliated with Islam, most of Kurdistan, not to mention Turkey, is Islamic. Still, others simply offered their condolences to the clearly ailing country, which surely it needs right now.